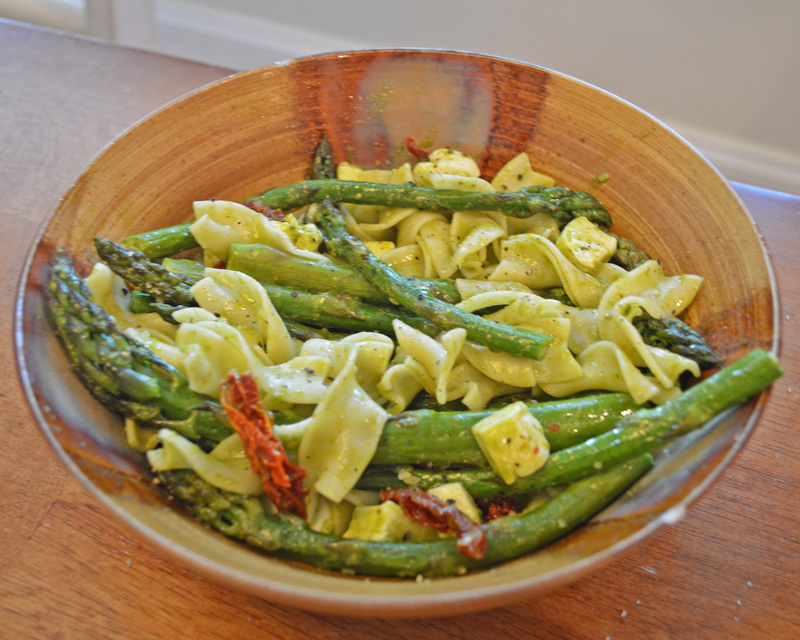 Asparagus Pesto Pasta with Sun-dried Tomato – Dancin' and Cookin' in the Kitchen! ← Planning, working, trying to keep up! I was CRAVING this today!!!! And, it totally lived up to the hype! So easy, only took me 20 minutes start to finish! Start the pasta, cook as directed on packaging until al dente. Then, preheat the oven to 350 degrees. Wash the asparagus, and remove the hard ends. What I do is bend it until it breaks. One hand on each end of the asparagus, and just bend gently like you’re going to bend it in half, and the hardest portion will break off. Take the top halves, and arrange in a single layer on a tin-foil lined tray. 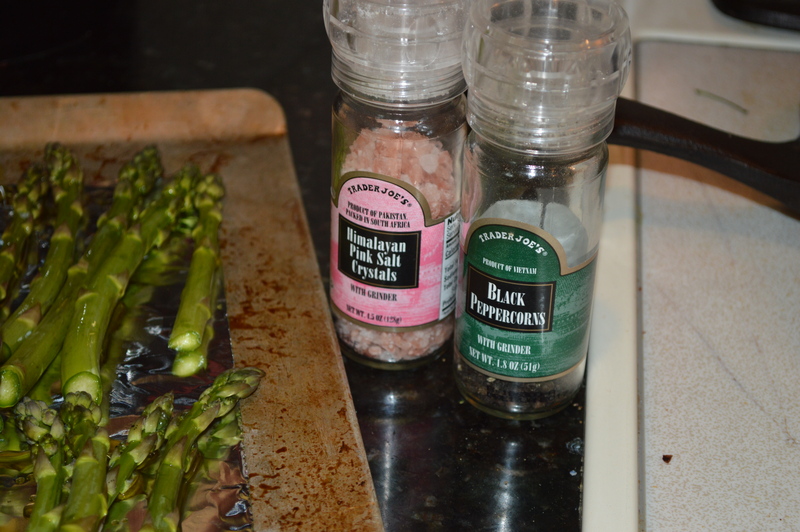 Sprinkle with 1-2 TB of olive oil and then season with sea salt and pepper as desired. Bake at 350 degrees for 15 minutes. Don’t cook it too long, or it will get stringy. Pesto: I buy 1 pkg of basil from TJ (it’s about 4 large branches worth of basil, so with leaves removed, it’s about 1 1/2 cups of basil). I blend mine up into my nutri-bullet until smooth. Add more oil as needed. I put my left over pesto in a cleaned and re-used jam jar (mason jar) and store it in the refrigerator. In the mean time, cut the ball of mozzarella in half, put 1/2 back in the refrigerator, and cut the other half into small cubes. Now, strain pasta, and remove the asparagus from the oven, and put all ingredients in a bowl and toss and season to taste. I also sprinkled a bit of parmesan over the top. ENJOY!!! 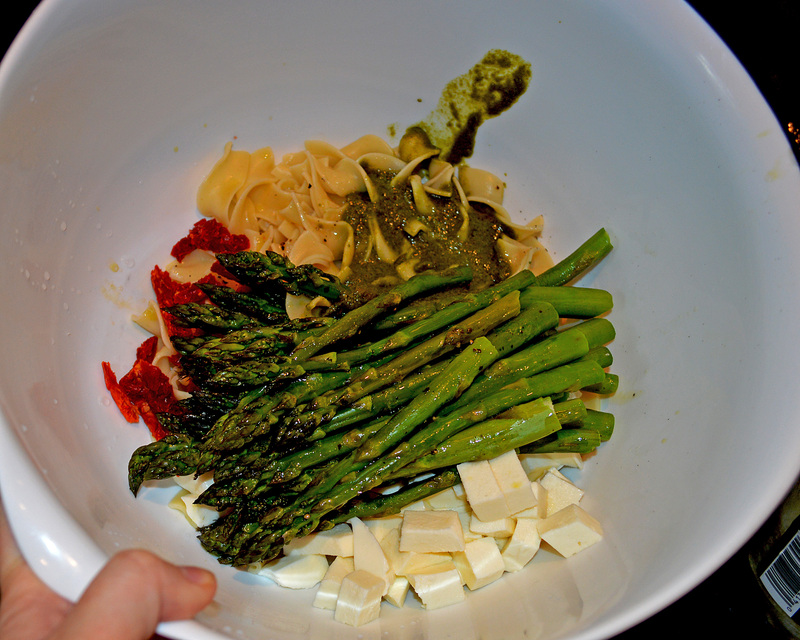 This entry was posted in Uncategorized and tagged asparagus, mozzarella, pesto, sundried tomatoes. Bookmark the permalink. 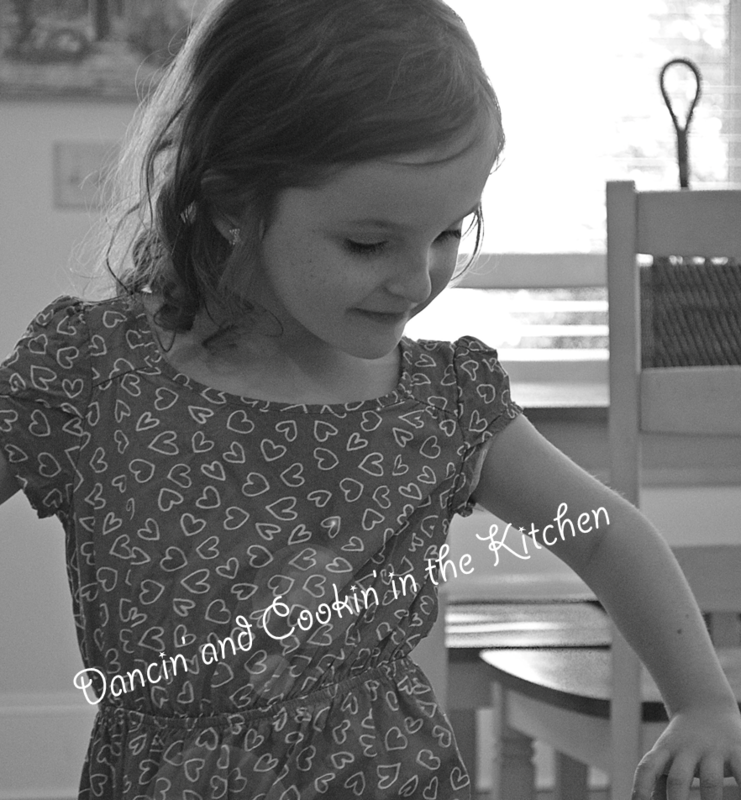 Pingback: Air-fried Hash and Brussel Sprouts Topped with an Egg and Pesto – Dancin' and Cookin' in the Kitchen!